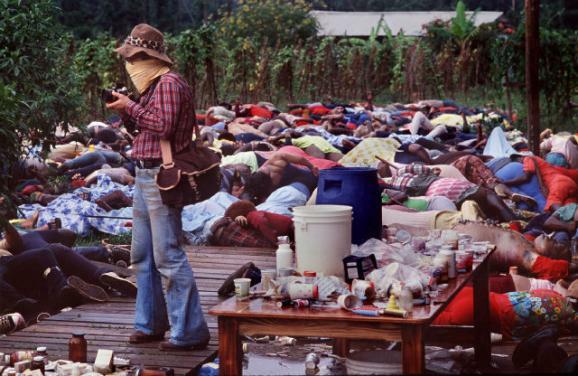 If you are my age or near it, you remember the Jonestown Massacre. Even if you are younger, if in 1978 you were old enough to watch TV news, you could hardly forget it. Now that fundamentalism is enjoying a rebirth with well-known political and religious leaders (who ought to know better) urging others to murder or mayhem, it’s probably a good time to remind everyone where this kind of thing can lead. There is nothing remotely amusing about this story. It was horrible when it happened and time hasn’t made it less so. The phrase “drink the Kool-Aid” has become common parlance in American business and politics. Roughly translated, it means “to blindly follow.” It usually carries a negative connotation. The “Kool Aid” references go all the back to the 1950s when it was the typical drink for children on suburban summer afternoons. The origin of the saying is something else — darker, and different. It has become the kind of bland rhetoric about which we don’t give a thought, but its roots lie in horror. Before we talk about Kool-Aid, let’s take a brief trip down memory lane to that particularly awful episode of American history. The lack of a possessive apostrophe was intentional. The name was supposed to be a reference to “the people of the world.” While Jones called it a church, it was closer to a warped version of a Marxist commune. Initially, it combined a hodgepodge of Christian references that Jones used in his diatribes … supposedly sermons. It was never a real church. The Peoples Temple was a straight-up cult. It required a level of commitment and financial support from members plus a degree of obedience that’s the defining quality of a cult. Jones was the cult’s leader — and a homicidal maniac. But he had positive attributes. Jones and his wife Marceline were in favor of racial integration. They adopted a bunch of kids from varying backgrounds and were the first white family in Indiana to adopt an African-American boy. Other adopted children included three Korean Americans, a Native American, and a handful of white kids. They also had a child of their own. Jones called his adopted kids the “Rainbow Family.” He made a name for himself desegregating institutions in Indiana. Before you get all dewy-eyed about this, note this story ultimately climaxes in the murder of all the Jones children by their parents. The Peoples Temple continued to expand through the 1960s. Jones gradually abandoned his Marxism. His preaching began to increasingly focus on impending nuclear apocalypse. He even specified a date — July 15, 1967 — and suggested afterwards, a socialist paradise would exist on Earth. Where would the new Eden be? Jones decided on Redwood Valley, California and before the expected apocalypse, he moved the Temple and its peoples there. When the end-of-the-world deadline passed without a holocaust, Jones quit pretending to be a Christian and revealed himself as an atheist who used religion to give his own opinions legitimacy. Jones announced that “Those who remained drugged with the opiate of religion must be brought to enlightenment — socialism.” Prophetic words since Jones was a drug addict who preferred literal to metaphorical opiates. As media attention increased, Jones worried the Peoples Temple’s tax-exempt religious status was in danger. He was paranoid about the U.S. intelligence community — probably with justification. In 1977, Jones moved the Temple and its people to a different site that Jones had been working on since 1974. It was located in Guyana and he modestly named it “Jonestown.” It was a bleak, inhospitable place. Built on 4000 acres with limited access to water, it was much too small and seriously overcrowded. Temple members had to work long hours just to keep from starving. Nonetheless, Jones decided his people would farm the land of his utopia. 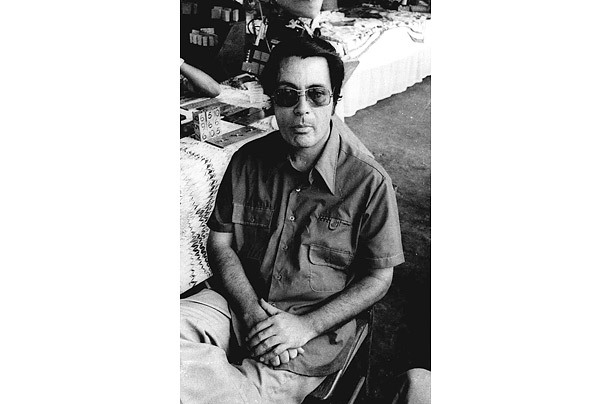 He had put together several million dollars before getting to Jonestown (he confiscated all his followers’ money), but wealth was not distributed. He barely used any of the money for himself and lived in a tiny, bare-bones shared house. U.S. Congressman Leo Ryan visited Jonestown in November of 1978. Rumors of peculiar goings-on were leaking out of Jonestown. Ryan decided to investigate rumors of abuses in Jonestown. Ryan didn’t travel alone. He took a contingent of media people including NBC News correspondent Don Harris and other reporters, plus relatives of Jonestown residents. He assumed that this would protect him — a major miscalculation. During his visit to Jonestown, Congressman Ryan talked to more than a dozen Temple members, all of whom said they wanted to leave. Several of them passed a note saying: “Please help us get out of Jonestown” to news anchor Harris. If the number of defectors seems low considering the more than 900 residents of Jonestown, remember they had not been allowed to talk to most of the “fellowship.” The number of those who wanted to leave could have been much more. We’ll never know. Ryan began processing the paperwork to repatriate Temple members. In the middle of this, Ryan was attacked with a knife by temple member Don Sly. This would-be assassin was stopped before Ryan was hurt. Eventually the Ryan party decided to leave. 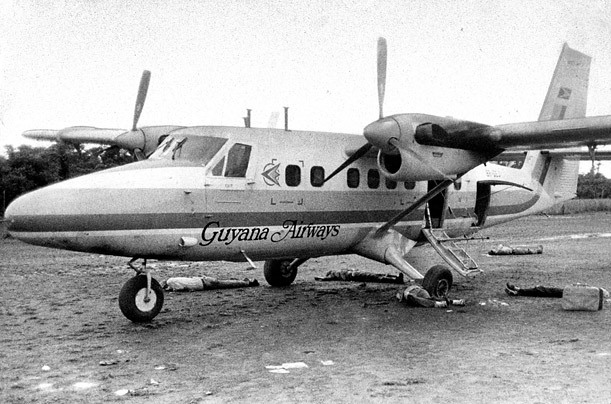 They and the Jonestown defectors drove to the airstrip and boarded planes. Jim Jones had other plans. He sent armed Temple members — his “Red Brigade” — after the Congressional party. These creepy “soldiers of the Temple” opened fire on them, killing Ryan, a Temple defector, three members of the media, and wounding eleven others. The survivors fled into the jungle. When the murderers returned to Jonestown and reported their actions, Jones promptly started what he called a “White Night” meeting. He invited all Temple members. This wasn’t the first White Night. 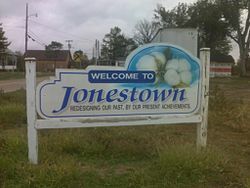 Jones had hosted previous White Night meetings in which he suggested U.S. intelligence agencies would soon attack Jonestown. He had even staged fake attacks to add a realism, though it’s hard to believe anyone was fooled. Faced with this invasion scenario, Jones told Temple members they could stay and fight imaginary invaders. They could take off for the USSR or run into the jungles of Guyana. Or they could commit mass suicide. On previous occasions Temple members had opted for suicide. Not satisfied, Jones had tested their commitment by giving them cups of liquid that supposedly contained poison. Which they drank (???). After a while, Jones told them the liquid wasn’t poison — but one day it would be. Jim Jones had been stockpiling poisons — cyanide and other drugs — for years. On this final White Night, Jones was no longer testing his followers. It was time to kill them all. 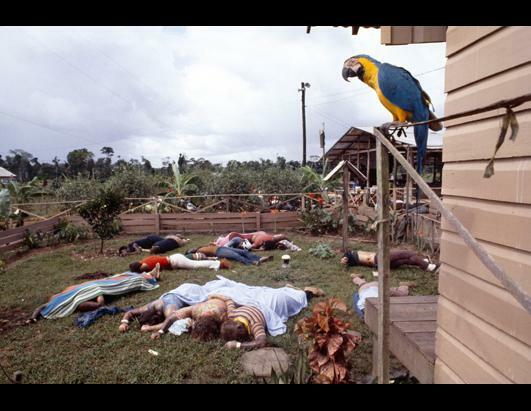 After the airstrip murders outside Jonestown, Jim Jones ordered Temple members to create a fruity mix containing a cocktail of chemicals that included cyanide, diazepam (Valium), promethazine (Phenergan — a sedative), chloral hydrate (a sedative/hypnotic sometimes called “knockout drops”), and Flavor Aid, a beverage similar to Kool-Aid. Jones told his followers they should commit suicide to make a political point. What that point was supposed to be is still a matter of considerable debate. Temple member Christine Miller suggested flying members to the USSR. Of course, Jones was never really interested in escape. There was only one answer that he would accept. Death and lots of it. He repeatedly pointed out to his followers that Congressman Ryan was dead (and whose fault was that?) which would surely bring down the weight of American retribution. An audiotape of this meeting exists. It is just as creepy as you’d expect. Then it was time for the detailed instructions which — still baffling to me at least — the followers did as they were told. I will never understand why. Probably that’s a positive sign indicating I’m not insane. Jones insisted mothers squirt poison into the mouths of their children using syringes. As their children died, the mothers were allowed to drink poison from cups. Temple members wandered out onto the ground where eventually just over 900 lay dead, including more than 300 children. Only a handful of survivors escaped — primarily those who happened to be away on errands or playing basketball when the mass suicide/massacre took place. Jones did not drink poison. He died from a gunshot to the head. It’s unclear if it was self-inflicted. Jones probably died last or nearly so and likely preferred the gun to cyanide. He had witnessed the horrendous effects of death by cyanide and preferred something quicker. In the wake of the tragedy at Jonestown, the phrase “drink the Kool-Aid” became a popular term for blind obedience, as Temple members had apparently accepted their cups of poison without objection. According to various accounts, the primary beverage used at Jonestown was actually Flavor Aid (sometimes “Flav-R-Aid”) — although both Kool-Aid and Flavor Aid were used. Kool-Aid was better known than Flavor Aid. Kool-Aid was introduced in 1927 in powdered form. When Americans thought about a powdered fruity drink mix (other than “Tang”), “Kool-Aid” came immediately to mind. So, although Kool-Aid and Flavor Aid were both present at Jonestown, the phrase “(don’t) drink the Kool-Aid” has become entrenched in popular lingo. Personally, I never touch the stuff. The question that comes up for me that needs to continually asked is why are people so scared of life that they follow along with systems that benefit only a few, whether it is Jonestown, Germany or the good ole U.S. of A? I have no clue. I have never been much of a follower and don’t understand how anyone could blindly follow like that. It boggles my mind. Did you take the post down? No. I just moved it. It’s right here. Actually, it’s up in a variety of forms. I may run it again. Like soon. I know, but why in the world did they follow him in the first place? I am old enough to clearly remember Jonestown and the massacre. Unbelievable. Great recap for those who weren’t around back then or who may have forgotten the details. Too many people are busy preaching death and cults — and seem to have forgotten where it can lead. I remember it too. It was hideous. I will never understand the mentality of followers. Blatant disrespect of Kool Aid! I never liked it. It tastes like melted lollipops. I remember it clearly, and finding it impossible to believe at the time. Reading it now, it is still mind boggling. So many people searching for something in their lives and finding an insane person to fill that void. So sad, so scary. No Kool Aid in our house growing up- my mother said it was all fake and chemicals! After all these years, it’s still incomprehensible to a sane person. We had coffee, fruit juice and milk. No Koolaid, no soft drinks. My mother was also a ‘natural food’ devotee long before her time. I think it takes a certain kind of mentality to be susceptible to a cult. I’m nobody’s follower and neither are you, so we will never understand. And I’m glad of that! I remember seeing this on the TV news. I was young and could not for the life of me figure out why mothers would willingly kill their babies! It made me feel ill and I did not sleep well for several weeks. It was around this point I began a true search for what I believed about God and my faith. This is the first “great tragedy” I remember. It was dreadful and I think a lot of us, young and old, had nightmares — for the same reason. What could make people behave like that? It’s enough to make anyone start looking for answers. Probably that’s the only value of something like this. It’s just like the people that follow the Roman Catholic Church and their absolute belief in the following & disciplining of the rules and regulation or you g o to HE’LL!They say they are the “only true church” ‘. How very sad. Just as foolish as the kool aid drinkers. Wow! What a horrible thing to say! As if the RCC would sanction such an atrocity. I don’t believe a Catholic has ever told you that you were going to HE’LL because the Catholic Church teaches that only Almighty God knows a person’s eternal destiny. You don’t have to be Catholic to know that. And, anyway, Holy Scripture makes clear that Christ did establish a Church and prayed that all believers would be one. If your church (whatever it is) isn’t the “only true church”, why are you even a member? This is not a good subject for me. I went into labor shortly after they started making announcements about this atrocity and news breaks came streaming into the hospital while I was giving birth. I kept thinking why are they playing the radio so this kind of negativity can be going inside of me while I am trying to bring life into the world. Always has a place of special evil to me. And no question of its evil and I question the common sense of anyone piping news of any kind into a hospital ward. It seems inappropriate no matter what news is on. I know you probably won’t have seen it, but there is a recent movie called The Sacrament, this is the IMDB link if you dont mind links (http://www.imdb.com/title/tt2383068/?ref_=nv_sr_1). Im going to be reviewing it soon, basically its copying The Jonestown Massacre, a decent but harrowing watch. Not that its gory or anything too bad, but more so because its so close to the events that happened. Strange the power some people can have over others. Thanks. We who lived through it happening are left with an indelible memory. It was horrible. No need to relive it. They can’t make a horror movie of it that’s more shocking than what REALLY happened. It was awful and deeply shocking to all of us. Thanks Mike. It’s my most-read post. It never went viral, never got a lot of hits in a day, but it keeps popping up. Some weeks, it gets hundreds of views … and it’s been around almost two years. I remember when this happened. It was so appalling, we couldn’t absorb how such an awful thing could happen, how people could let it happen to them. I think, for me, it was THE worst event … even worse than all the assassinations. Madness. The real deal. I don’t know which is worse, the fact that many drank willingly or that many were not willing. There’s awfulness to go around. Twice. How the situation reached this point, that somehow no one stopped this lunatic … talk about slipping through the net. This was about as awful as it gets. It is so shocking ! mind boggling & scary at the same time. It was a horrible thing. Not easily forgotten, though apparently many people have, indeed, forgotten. Good to have you back. I’ve been thinking about you! I was a teenager living in the middle of nowhere in a tiny African country when this happened. At that time we received little outside news (something to do with sanctions I think) but this story made it through. It shocked me to the core then and again today, after reading this I feel the same shock. Later at university in South Africa we studied the case in a psychology class. Such a dark, evil story. It has always left me wondering about the depths of human depravity — and the depths of human stupidity. Jim Jones was evil, but WHY DID THEY FOLLOW HIM? This was mind- numbing get. Yes, it was. Is. Even after all these years, hard to comprehend.